Monrovia Falls is one of the most delightful waterfalls experiences in the front range of the San Gabriels. At 30 feet tall, this year-around falls is not the biggest or most spectacular, but the splendid trail and picturesque scenery getting there makes the visit to the falls a real treat. And it's short: Three trailhead options give a range of distances from 1.5 miles round trip to 3.4 miles round trip. The trail leads through several plant communities: coastal sage scrub, chaparral, oak woodland, and riparian. Along the hike you'll enjoy a canopy of coast live oak, canyon oak, white alders, big leaf maple, and sycamore trees. Some of the biggest poison oak leaves I have ever seen are along the trial. The downside of Monrovia Falls is the $5 or $6 parking fee, the restrictive park hours (8 a.m. to 5 p.m.; closed Tuesdays) and the crowds. On a typical weekend there will be dozens and dozens of people on the trail and congregating around the base of the falls. The trail is part of Monrovia Canyon Park, under the jurisdiction of the City of Monrovia Department of Public Works, Parks Division. If you want to avoid the parking fee and/or hike before or after hours, you can park in the residential area outside the park and walk along the road 0.6 mile to the park entry station. The best season is in the spring when the weather is pleasant, the forest is green, flowers are blooming, and the water is flowing briskly. There's lots of shade en route so even in the summertime the hike can be fine. The fall offers some autumn color with changing leaves, but there won�t be much water in streams. The winter will see water beginning to flow and new life to annual grasses, however the deciduous shrubs (like Poison Oak) and trees (like white alder and big-leaf maple) are leafless. See Seasons of the San Gabriels for a detailed description of minding the seasons. On the I-210 Foothill Freeway driving through Monrovia (about 2 miles west of the 605 Freeway), exit at Myrtle Avenue and turn north (toward the mountains). Drive north on Myrtle through Old Town Monrovia one mile to Foothill Blvd. Turn right and go two lights to Canyon Blvd. Turn left, drive through residential area for about 0.7 mile to Scenic Dr. and follow Canyon Blvd as it curves to the right. 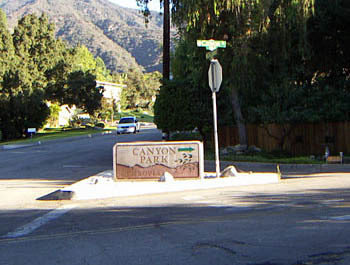 In another 0.3 mile, turn right into Canyon Park at the three-foot tall monument sign. Go 0.6 to the park entry station. If you are hiking the Bill Cull Trail (3.4 miles round trip), park in the lower lot just before getting to the entry station. If you are hiking the Cabin Trail (from middle parking lot) (2.0 miles round trip), drive about 0.3 mile past the entry station and park in the small lot on the right next to the restrooms. Walk about 75 yards up the road; the trail begins on your left just before hairpin turn. For the shortest hike to the falls (1.5 miles round trip), drive.0.6 mile past the entry station to the nature center parking lot. Walk to the right of the nature center building following the broad path through the picnic area to find the marked trailhead. Park Hours: 8 a.m to 5 p.m. The park is closed on Tuesdays. Lower main gate is locked at 5 p.m.
Vehical entry fees - Cars: $5 weekdays, $6 weekends and holidays. Bill Cull Trail (3.4 miles r.t.): From the lower parking area, walk past the entry station about 75 yards to the signed trailhead on the left. Walk past the sign and up the trail. Three switchbacks in the first quarter mile will have you traveling in the direction of all four cardinal compass points before you proceed in a northward direction up canyon. You'll be climbing steadily along the side of the canyon through a mature oak forest and chaparral. In about a half mile the trail crosses the tributary stream then cuts back southeast, crossing the main stream to reach a marked trail junction (reads 3/4 miles to the falls). If you go right, it's about a five-minute walk to the trailhead at the middle parking area (with restrooms). But to reach the falls, turn left and continue up steam. In three minutes you reach the Nature Center trail junction. If you turn sharp right it's less than a 2-minute walk ascending to the nature center. But go straight and In another minute the trail passes a check dam and crosses the creek, then climbs up the west slope paralleling the stream. The well-traveled trail ascends through lush green forest. En route you'll pass several check dams, providing soothing sounds of falling water. 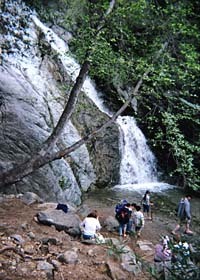 After a net elevation gain of 720 feet from the entry station trailhead, you'll reach Monrovia Canyon Falls. Enjoy the beauty of the setting, then return the way you came. Or you can return via one of the two routes below and walk the road back down. Cabin Trail (from middle parking lot) (2.0 miles round trip): From the small parking lot next to the restrooms. Walk about 75 yards up the road; the trail begins on your left just before a hairpin turn. Follow the trail and in a few minutes you'll reach a trail junction where you join the main trail (this is where the Bill Cull trail intersects from the west). In another 0.2 mile you reach the unmarked Nature Center trail junction. Now follow the trail description from the Bill Cull Trail above. Nature Center Trail (1.5 miles round trip): Walk to the right of the nature center building, following the broad path through the picnic area to find the marked trailhead (3/4 mi. to falls). Walk down the trail and in about a minute you will intersect the main trail. Now follow the trail description from the Bill Cull Trail above (from the point of the Nature Center trail junction). Bill Cull Trail mileage - At the trailhead, The Bill Cull Trail dedication sign places the mileage to the falls at 1 3/4 miles. But the plastic trail marker next to the sign puts the mileage at 1 1/2 miles. The park brochure and website put the mileage at 1.7. Mileage discrepancies on maps and trail signs is common throughout the San Gabriels. So don't lose any sleep over it. When I asked a park attendant about the discrepancy, he said he measured the distance at 1.5 to the falls, but they did not want to replace the dedication sign. Hazards include Poison oak, rattlesnakes, mosquitoes, and ticks. Mosquitoes and bugs can be awful at times, so use a good deet-based repellent. Mosquitoes may be carrying the West Nile Virus. Occasionally bears and mountain lions are sighted int he park. A wise hiker will always be aware of the potential risks of being outdoors. Ben Overturff Trail - Monrovia Canyon Park is also the trailhead for Ben Overturff Trail, Sawpit Canyon to Deer Park (Hike #48 in John Robinson's Trails of the Angeles - 6 miles r.t., 1100' elevation gain). Unfortunately the first 1.0 mile from the park entrance to the Camp Trask Gate is on a paved road, some places quite steep, and the next 0.3 mile to the trailhead is on a dirt road. Thus, you have 1.3 miles of walking on a road before you even reach the trail. The sign there indicates 2.0 miles to Deer Flat on the trail, a total round trip hike of 6.6 miles (Robinson states 6.0). 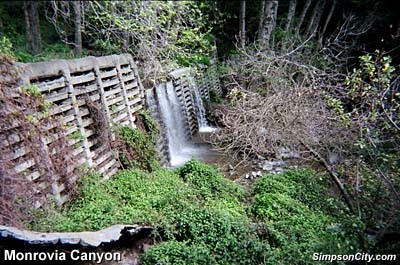 See the "Un-Official" Monrovia Canyon Park Website by Bob Dollins for a Canyon Park Trails Map, which inlcludes Ben Overturff Trail. Monrovia Canyon Park official website - by the City of Monrovia. It USED to have lots of information, map, photos, history, helpful tips, etc. But they gutted the site and now the information is bare bones. 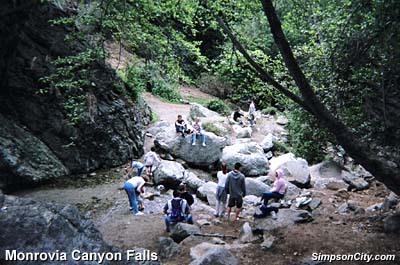 "Un-Official" Monrovia Canyon Park Website - by Bob Dollins. Tons of information about the park and trails, including maps. Hike D10. Monrovia Canyon - by Christopher Brennen, Adventure Hikes and Canyoneering in the San Gabriels. Good description of an adventure hike coming down canyon, dropping in from Upper Clamshell Road. Topo map and two photos. Afoot and Afield in Los Angeles County - by Jerry Schad (Wilderness Press: Berkley, Second Edition, 2000) - Area B-9, Trip 1: "Monrovia Canyon Falls." Good write-up. Describes the hike from the Nature Center at 1.6 miles round trip with 500 feet in elevation gain. California Waterfalls - by Ann Marie Brown (Foghorn Press, 1997) - "Monrovia Falls". A guide to 200 waterfalls in California. She writes up 14 waterfalls in the San Gabriels and gives Monrovia Canyon Falls a rating of 8 (6=good, 7=great, 8=excellent, 9=spetacular 10="Top 20 in California"). Brief write-up. Describes the hike from the Nature Center at 1.4 miles round trip with 100 feet in elevation gain. This page was last updated July 30, 2014.